Nestled on the hillside, the Hellman Guest House Bed and Breakfast provides spectacular views of the historic town of Galena, Grant Park and the surrounding countryside. We are away from the congestion in a quiet residential neighborhood, yet still a short walk to shopping and fine dining on downtown Main Street. A visit to Galena is like stepping back in time and the Hellman Guest House can provide you with a truly peaceful and relaxing respite from everyday life. There is an abundance of activities for outdoor enthusiasts to enjoy such as golf, horseback riding, hot air ballooning, vinegard tours, birding, hiking, kayaking and even snow skiing in winter, to name a few. In addition, there is an abundance of sites for history buffs to explore, including the town's rich architectural heritage. Built in 1895, this Queen Anne Victorian glows with beauty and elegance. The view from the large wraparound porch is the finest on the hill. The wraparound front porch is the perfect spot to take in the panaramic views, along with sounds of nature and the occasional distant toll of church bells. It is our guests' favorite spot to relax and enjoy a bottle of locally produced wine at the end of their day. You're sure to enjoy our comfortable, inviting home with its period furnishings. Built in 1895 by a wealthy merchant, the home still retains its original stained glass and leaded glass windows throughout the house, the five original fireplaces, sliding pocket doors and original woodwork. The home is also listed on the National Register. All guest rooms have private baths, TV/cable and video library, wireless internet and air conditioning. Call 815-777-3638 or e-mail now for availability. Any time of year is a good time to visit. In spring and summer, flowers abound, along with birds and lush greenery in the gardens that surround the house. In fall, the panorama of colors, punctuated by white church steeples, rivals that of New England. In winter, the view of the town and surrounding countryside blanketed with snow is truly peaceful and serene. Combine all this with comfortable rooms and unmatched service and hospitality, and you will certainly want to return to the Hellman Guest House again and again, as many of our guests have been doing for years. Stay with us and experience it for yourself. Oh, and we mention our very popular bottomless homemade cookie jar?? 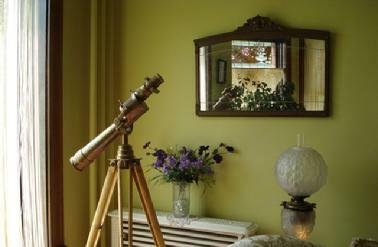 Get a close-up view of Galena through the antique brass telescope. Browse through the other pages on this site to tour the house, gardens and guest rooms. Also be sure to check out the current and upcoming events. Then contact Rita Wadman by phone at 815-777-3638 or by email for help in planning your next visit to Galena. We'd love to see you.